It was only one year ago that we visited the fellas at Lauf Forks in Iceland to launch their gravel fork. Well, Lauf “Forks” is gone and has been rebranded as Lauf Cycles. You know what that means? We went back to Iceland to see what they have created and see if they could top the scenic views and epic riding we enjoyed last round. The new True Grit frame weighs in at a stunning 1070 grams. The New addition to the Lauf catalog is indeed as the name hints, a bike. Better yet it’s a gravel bike and the first impressions are impressive. 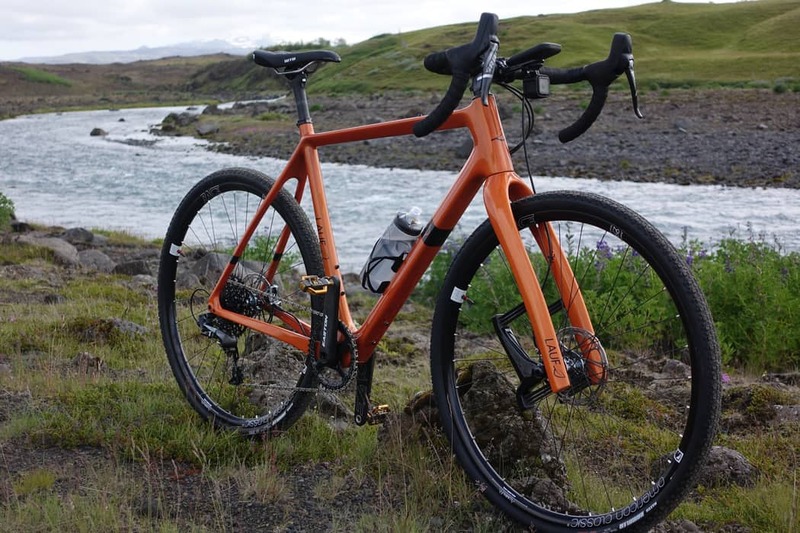 While the gravel category continues to explode with specific bikes and gear the guys at Lauf felt it was the natural evolution of their brand no matter where the market leads. While the main city of Reykjavík has plenty of paved bike paths and roads you don’t have to explore far to realize that many of their roads are dirt. The further you explore the less maintained they get thus leading to the need for more than most road specific bikes offer. While the Maxxis Ramblers we used were 40mm, the frame fits 45mm 700c tires with room to spare. Thus the birth of the True Grit that Lauf says is a bike for anyone that enjoys a confident, stable and fast ride. The bike will be offered initially in three build options or as a frame and fork. There will be two stock colors to choose from but for a small price bump, they will offer several premium colors too. That’s not it, with the task of designing and developing the frame they also further tuned and improved the Grit fork. So all True Grit bikes will have the new Grit SL fork with 30mm of travel and improved springs that are a perfect match for the geometry of the frame. The Grit SL for is 50 grams lighter and has a slightly less dramatic bend in the leg. It will have an integrated 1.5″ crown race, 12X142 thru-axle and flat-mount for disc brakes. When it comes to frame specifics and sizing Lauf is offering three sizes S,M and L. There will be short and long versions of each size, that just means the stem length is different. The wheelbase on the medium is 104.2cm thanks to the long 57.1cm top tube and 70.5 degree head tube. But this is meant to match with a short stem delivering on the promise of a stable and confidence inspiring ride. While we only spent two days this time riding in the highlands of Iceland they delivered some of the most memorable days on a bike we might ever have. Day one was a lovely tail wind charged ride offering maybe the best weather Iceland has to offer. Sunburn and new tan lines were the talk of dinner as we reflected on the majesty of the bike and the route. Day two was a bit different, to say the least, and evolved into some of the most extreme conditions that any of us had ever endured. Not only was the rain relentless but so was the wind. The route consisted of over twenty river crossings that averaged knee to waist deep. The True Grit was the perfect tool to handle both days of riding. From the smooth and fast roads that eventually turned to double track on day one all the way to the weather battered roads of day two. Not only did the bike perform amazing but it was as they promised confidence inspiring and that’s a feat in itself since most of day two was spent with side and headwinds that averaged 55-60 mph and gusts that well exceeded. While much of our riding was spent completely focused on the task of keeping upright there wasn’t a single mechanical or issue. The new bike seems to be a success and any bike that could endure the elements that we did says a lot about its design. The frame is light at 1070 grams for a size medium and the Race Edition build in size medium weighs in at 17.2LB. There is plenty of room for large 45mm 700c tires with room to spare. Don’t let that trick you because a set of 30-32mm tires are also a great match for those that choose the paved roads. All said and done the True Grit seems to be an all around great pick that offers stiffness, stability, compliance and versatility all at a competitive price. We can’t wait to get a True Grit with the new SL fork back to the office for a full review.